Parents and teens should review the driver’s manual. Focus on signs, signals, pavement markings, yield and speed laws. If possible, begin integrating night driving into sessions 8-10. During the next three sessions, practice 10-15 right and left turns from stopped and moving positions in a parking lot. Left turns should be “squared” and right turns should be “rounded.” Emphasize proper signals, mirror checks, side-position reference points, speed and steering control, and the need to look ahead of the vehicle at a selected target in the center of the path of travel. Warn young drivers not to fixate on any one thing. Prior to progressing to driving in a quiet neighborhood, your teen should be able to demonstrate the ability to move and stop the car smoothly, maintain a given speed, and steer with reasonable precision. If your teen is ready, practice right and left turns in a residential area. When turning out of a parking lot, help the new driver maintain proper lane position by asking him or her to identify a target 15-20 seconds ahead of the vehicle (approximately one block). Have the driver use commentary driving to explain what he or she sees and the proper reaction to it. Ask the new driver to verbalize the need to change speed or position, and to identify potential risks in the path of travel. This will enhance awareness of signs and pavement markings, and help your teen develop visual scanning and risk identification skills. If the road has pavement markings, discourage the novice driver from looking at the lines to try to “center the vehicle.” Any eye motion away from the target in the center of the path of travel should be quick; delayed eye movement or looking at the pavement directly in front of the vehicle will often cause the vehicle to drift in the lane. Coach your teen to scan and not focus on anything at the sides of the path of travel. Drivers have a tendency to steer in the direction they look, especially young drivers. select the best lane and lane position and yield to pedestrians and other vehicles. The steps are the same whether turning onto a one-way or two-way street. Position the vehicle 3 feet from the curb (if any closer, the rear tire may hit curb). Stop with the front bumper even with the curb line and wheels angled slightly to the right. Yield and search intersection to the left, front, right, and back to the left. Select a gap in traffic, avoid hesitation, and look at the target in the center of the path of travel. Using hand-to-hand steering, begin to turn the steering wheel when the vehicle’s right-side corner post is aligned with curb and target the center of the closest open lane. Allow the steering wheel to recover by letting it slide through the hands. The steering recovery point is when your wheels are straight and your vehicle is still at an angle. Be sure to say “recovery point”. Select a target 15-20 seconds ahead and accelerate gradually. NOTE: Selecting a gap in traffic is a very difficult skill for most novice drivers and requires a lot of practice! Position the vehicle 3-6 inches from the yellow line in the middle of the road. Stop with wheels pointed straight ahead behind the stop line, pedestrian crosswalk, or before entering an intersection. Search the intersection to the left, front, right, and back to the left. Select a gap, avoid hesitation, and pull straight forward towards the middle of the intersection. Use the yellow line as the turning target, select gap and turn into the travel lane closest to the yellow line. At the steering recovery point, allow the steering wheel to slide through the hands. Select a new target 15-20 seconds ahead in the center of the path of travel and accelerate gradually. Make sure the teen understands right-of-way rules to avoid conflicts and to determine adequate gap to safely cross the pathway of the approaching vehicles. 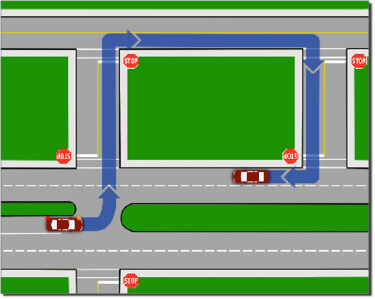 Poorly executed left turns result in t-bone crashes and consequently are very dangerous maneuvers for new drivers. NOTE: Right-of-way is something to be given, not taken.